Capdepera Golf, Majorca: Capdepera Golf is ideal for learning and teaching. Plenty of space on the range, difficult and easier nines cater for different playing levels. 4 Golf courses within 15 mins of driving. Golf Son Gual, Majorca: Since opening in 2007, the course got famous for quality and design standards. It's holes are all having that little something, making a round of golf a great experience. 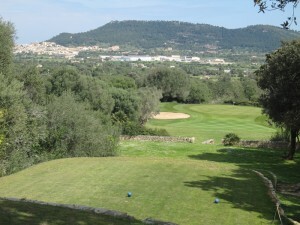 Canyamel Golf, Majorca: Canyamel Golf is definitely one of the best clubs quality wise on the island. Some interesting holes and difficult greens make your day a nice day to remember, but probably not a good score day. The course is a difficult one. But we all do like a little challenge, don't we? Santa Ponsa 1, Majorca: Santa Ponsa Golf 1 is a fun course, offering interesting holes with wide fairways and tight Par 4s that require strategy to get a score home. The practice facilities are spacious and the range has a covered roof. Golf de Andratx, Majorca: (Español) Es uno de los más famosos de la isla por la cantidad de vips y celebridades que juegan en él. Es bastante sinuoso: incluye coche eléctrico en su green fee.